Great timing: I am bored with my summer clothes, and getting desperate to wear something new/different – and along comes Chadwick’s of Boston, kindly offering me a selection from their Fall collection. Chadwick’s of Boston has a terrific variety of pieces for women of all ages and sizes: Tall, Petites and Plus sizes all pay the same affordable price, too. This Chadwick’s of Boston wool plaid skirt is nicely made and finished, the wool is soft and comfortable, and I love, love the vertical fringe detail. The muted colors make it perfect to wear with solid sweaters and tights, or mix up a bit like I’ve done here. 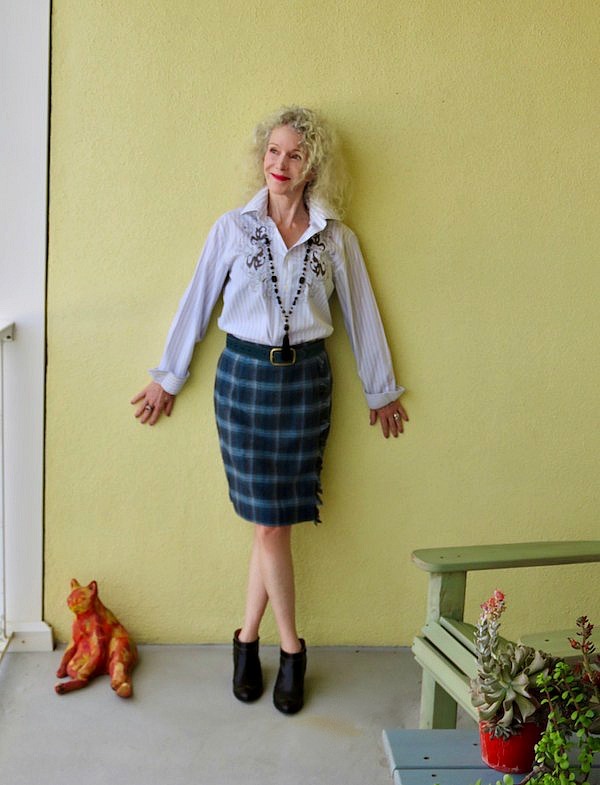 Versatile, comfortable and modern – that’s what I like about this skirt and many other pieces I’ve seen at the Chadwick’s of Boston site (easy ordering too). Their target audience is basically us over-40 women who may not dress for corporate life, but who are active and style-conscious. Feeling good in my new wool plaid skirt, and thrifted men’s shirt. Necklace by Suzanne Carillo. Here’s a look at the soft wool fabric, and side fringe. Nice. The plaids are matched perfectly, a sign of great construction. Hidden back zipper. Wool fit and flare blazer – love the shape of this one. Stripe cardigan with exceptional design front and back. A very versatile great skirt. it is functional yet aesthetic. Love to have one in my wardrobe! Awesome skirt, Patti! Love how you’ve styled it too, very You. That Plaid is lovely on you! Perfect for fall! Yes, the fringe is so fun! What a great detail. And I love this with your men’s shirt with the cool stitchery. Great combo. Love, love, love this! The skirt is so pretty and the fringe detail gives it some edge. The blouse is just the absolute perfect finishing touch! This was one of my choices, Patti because I loved it too!! Again…I just have to say, great minds think alike!! I love how you paired it with this print shirt—very modern!! That wee fringing just makes it. I’m a big fan of plaid (or check or tartan as we say over here) and you look stylish and comfortable and the shirt is a great choice – especially love the detailing on the back! So much plaid everywhere already, and although I dread the onset of autumn I secretly love plaid making its annual return!! Fab skirt Patti, thanks for hosting! I love plaid! I’m getting kinda bored with my summer clothes, too. That flared blazer is to die for cute!! And yes…. we are north of you in Virginia and the weather is fabulously cool this week. Fabulous skirt! I love the fringing on the side! Thanks for sharing about Chadwicks, as I hadn’t heard of them before and love learning about new-to-me places :). I think it’s so awesome when companies cater to different heights&sizes, and wish more would! I love the plaid skirt your chose; the fringe is such a great trendy touch. The wild Catholic school girl look, Patti. You’re killing me, girl. Our customers love a bit of tartan, when I find vintage kilts they fly off the rails. The fringe is such a fun detail! Love this look. Thanks for hosting!! I love the colors, the fringe and style on you Patti! It looks great! Love the design on the back of your shirt as well. Oh fun … I’m glad you’re doing the Chadwick’s thing too. What a great pick. That skirt looks darling on you! This looks like such a great quality piece. Plaid is always in style for fall. 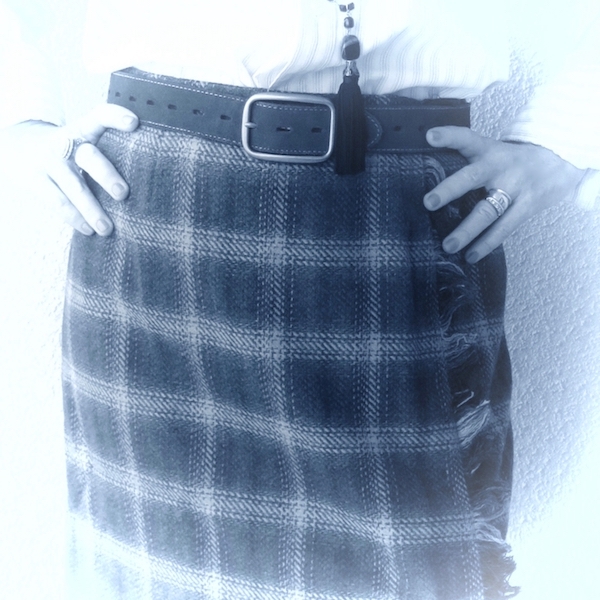 I’ve been picking up loads of great plaid skirts while thrifting lately, from Scotland and England. They truly do stand the test of time. I like how you’ve mixed up the classic style of the plaid with the modern shirt, boho necklace and booties. It is a great eclectic mix that shows that plaid is anything but boring. Fabulous pattern mix and I like the popped collar and booties with this look! The plaid skirt looks amazing with its colors and side fringe. I had forgotten about Chadwick’s and am now encouraged to give them another look. That skirt is so lovely – the fringes make it more so!!! What a lovely skirt – love the fringes!!! That skirt is gorgeous! I love a good plaid skirt in the fall! The plaid skirt is perfect on you , classic but with a twist. Your shirt adds your own touch.Many thanks for hosting Visible Monday. I’m loving this fun fringy skirt on you! Beautiful styling! Thanks for the link up. First of all that skirt – I am dying. Perfect plaid, warmth and length for now. I also love the fringe effect. That western-inspired blouse is fun and elegant too, real unique. One of your very best outfits yet, Patti. That is a gorgeous plaid skirt, Patti! Love the little fringe detail, and the pretty colour palette. I just swapped out my closet for the season, and I’m thrilled to bring out a ton of plaids! Thank you so much for hosting! Great styling Patti! Lovely skirt and simply gorgeous shirt! What a perfect way to welcome in fall with that incredibly stylish plaid skirt. It’s a classic staple that you will be able to use all through winter and for years to come. The skirt is beautiful, and you look fantastic in it! And the vertical fringe detail is great! That skirt looks wonderful on you! I love the fringe down the front! What a great skirt for fall, Patti. You look fall-perfect in it! Thanks for sharing the information about Chadwick’s of Boston! Oh, I love that skirt!! The colour is beautiful, and plaid -well, that’s just perfect for fall. Have a great week, Patti!